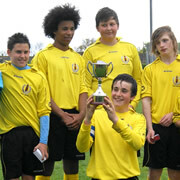 The annual Winky Sixes football tournament took place over the weekend of Saturday 3rd and Sunday 4th June. 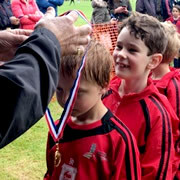 Youth football teams from under 7s to under 15s from all over the Southwest gathered at Wincanton Sports Ground for the tournament. Wincanton Town FC (Youth Section) has started 2015 with five of our teams having new kits, which have been kindly donated by local businesses. Wincanton Town FC (Youth Section) Under 14s got off to a winning start to their season in a new kit supplied by sponsors J Bailey and Sons Ltd.
During the Open Day festivities on Sat 14th June at Wincanton Sports Ground, the Town Mayor, Mr Deryck Lemon, officially made available a defibrillator called HeartSafe, installed from money raised by Wincanton Town FC (Youth Section). 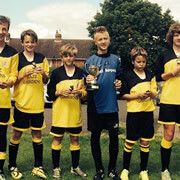 A new team has arrived at Wincanton Town FC (Youth Section), and on Saturday 14th June they brought home more silverware when they entered the Under 13s section of the Henstridge FC 5-a-side Tournament. 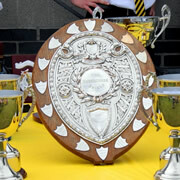 The 2013/14 season has been very successful for Wincanton Town FC (Youth Section), with two of our teams not only winning their respective leagues and League Knockout Cups, but our Under 16's also won the Yeovil Youth Football Shield. 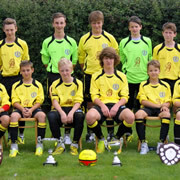 Wincanton Town Football Club (Youth Section) Under 14s and Under 16s teams have had fantastic seasons this year, culminating in two wins at the Yeovil and District Youth League Finals Day at Somerton Sports and Social Club on Sunday 27th April. On Friday 28th June Wincanton Town Football Club (Youth Section) is holding their Annual General Meeting at Wincanton Sports Ground. It starts at 7.30pm and anyone interested in getting involved with the club is welcome to come along. 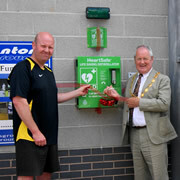 On Saturday 22nd June, members of Wincanton Town Football Club (Youth Section) are taking part in a sponsored walk to raise money for the purchase of an Automated Electronic Defibrillator. Wincanton Town FC (Youth Section) and AFC Bournemouth are running a soccer school over the Easter holidays between 3rd and 5th April 2013. Places are filling fast, so apply right now! Wincanton Town FC (Youth Section) in conjunction with AFC Bournemouth, go from strength to strength, with extra coaching from AFCB coaches and five soccer schools from February to October. Members of Wincanton Town FC (Youth Section) got to experience what it would be like to be professional footballers, with League 1 Team AFC Bournemouth, when they spent a day at the club recently. Wincanton Town FC (Youth Section), in partnership with AFC Bournemouth, has held its first ever Soccer School over the first three days of August, at Maddocks Park Sports Ground, for boys and girls aged 6 to 16. Wincanton Town FC (Youth Section) in partnership with AFC Bournemouth is holding a Soccer School in August for children between the ages of 6 and 16. Book your child's place now and be trained by AFC Bournemouth's professional coaches! On Sat 21st April, Wincanton Town FC (Youth Section), hosted the Somerset Girls League Under 13s and Under 14s, Cup Finals at Wincanton Sports Ground, Maddocks Park. In broad daylight on the Tuesday 10th April, thieves made off with a football net belonging to Wincanton Town Football Club (Youth Section) from their home at Wincanton Sports Ground. 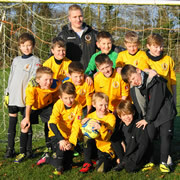 Wincanton Town Youth FC Receives Early Christmas Present! As the local FA Chartered Standard Football Club for the area, Wincanton Town Youth Football Club is pleased to announce the support of a local company in their quest to continue to offer football for all in the community. Teen Ref Ellie Farrell - Premiership Referee of Tomorrow? Ellie Farrell didn't allow the lack of local female players to dim her passion for football. Today more and more women are taking up the whistle and red and yellow cards, which are the trademarks of an FA qualified referee. With the start of a new season comes the need for new strips and two local businesses have kindly sponsored kits for two of our young teams. Your chance to support the club. 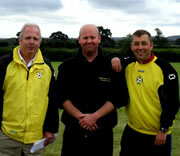 Three football coaches from Wincanton Town Youth FC are walking 31 miles in aid of the Football Club.